With my new ARCHOS GamePad, I decided to finally play a game I couldn’t on my PSP Go, due to a progress-stopping bug – Jade Cocoon. What is Jade Cocoon? The closest you can get to Pokemon without touching Nintendo, probably. At least it was in those days. 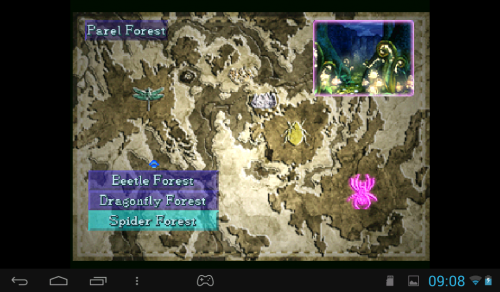 I tried playing Jade Cocoon on my PSP and I managed to clear the Beetle Forest, which is, for the most part, a glorified tutorial. After that, I got to the Dragonfly forest and then encountered a bug where the game would simply lock up, preventing any sort of progression. Since the Beetle forest is relatively short, I didn’t write a report on it, hoping to one day continue Jade Cocoon on my PC. Now that I have the GamePad, there is no need for that. The animations look great and are enjoyable to watch. It took some time for me to figure out what my plan was, but here in order to explain it, I need to explain the game. Jade Cocoon is a game where you catch and train monsters, Pokemon style. The twist is that you also get to combine these monsters. 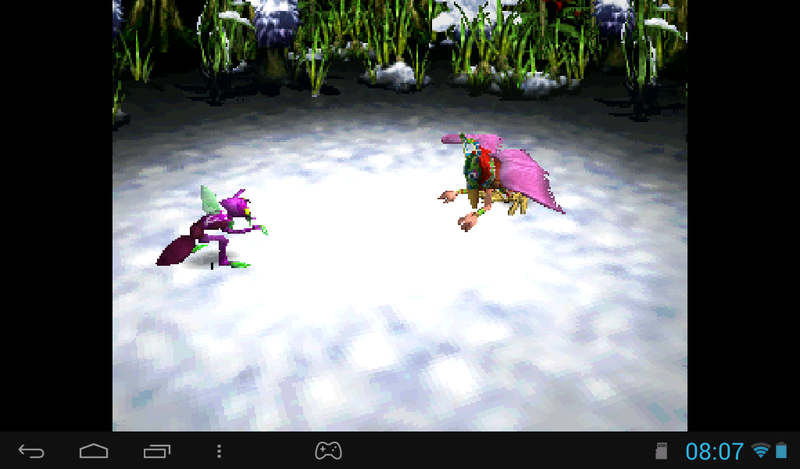 Since the game is 3D, and it uses 3D models for these monsters, it did some very high-tech stuff for it-s time – the models also combined, creating brand new monsters. I don’t think it was procedural and it’s far more likely that there was simply a predefined set of models and combinations you could get, but it was still amazing for its time. 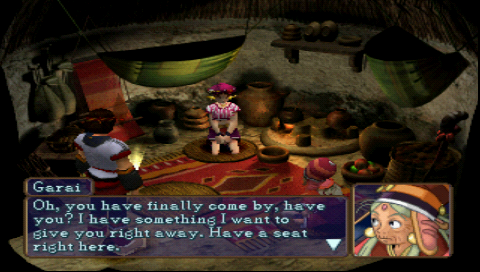 Your wife purifies the captured monsters and enables their use and merging. I had a demo as a kid, but I never went past that. 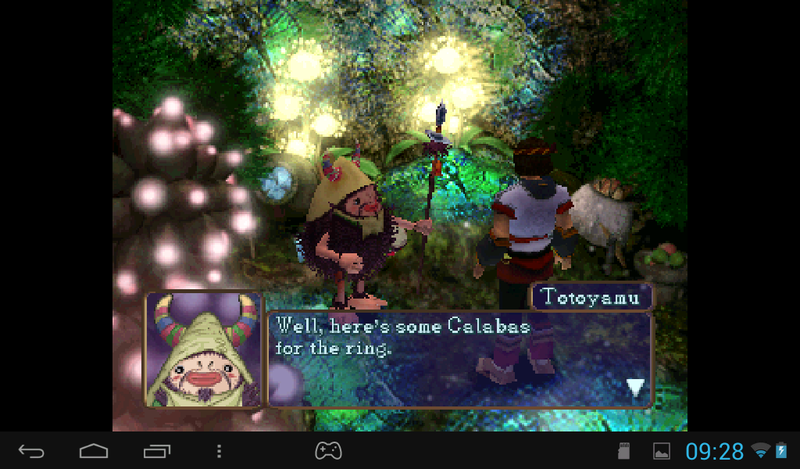 During my days of piracy, I also got a pirated copy from a local distributor and tried to play it on the PC I had back then, but I gave up somewhere around the third forest and I barely remember any of it. 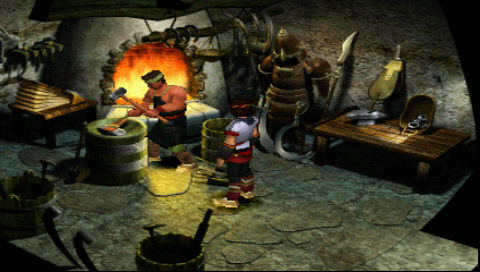 The village blacksmith sells gear for Levant, though the monsters do most the fighting. I should probably mention that the game’s characters are designed by Katsuya Kondō of Studio Ghibli, so his specific style is very recognizable throughout. Jade Cocoon looks very nice, even today, albeit a bit pixelated. 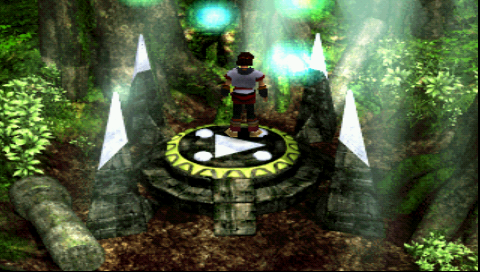 The monsters in the game can be any of four elements, which have a circular dependency with the previous one being strong against the next one. You can combine elements with each other, but this weakens the elemental affinities. This is how you capture monsters, once they are weakened. There are also four stat directions a monster can grow into, with two pairs of opposites cancelling out each other. Attack and Magic are opposites, and so are Speed and Defense. You can make a monster that’s nicely balanced, but then it seems its stats will never be very high. What seems to be a good approach is to pair two of non-opposite stats and focus on both. The potential pairs are attack-defense, attack-speed, magic-defense and magic-speed. The merging is the coolest part of the game. Juggy (short for Juggernaut) will be my speedy physical attacker, meaning he will focus on attack and speed. Since I can only carry three monsters with me, one of them should probably have two elements, so I picked Juggy. His elements are Earth and Air, since that way, he’s left with only one weakness (Air is strong against Earth, so that should cancel out). This guy serves as an early guide and info booth. Glut will be my fire-elemental speedy magician, so his stats are magic and speed. The only fire spells I’ve seen seem to be offensive, so I thought this would be a good choice. I also have yet to encounter a fire skill and I’ve only seen spells of this element. The forests have these warp pads, which serve as shortcuts. 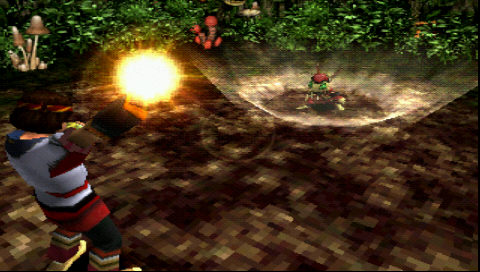 You need to find an item in the forest to use them. Undine will be my water defensive magician. Water contains healing spells, so I figured the most logical defender would also be a healer. That being said, I have no idea if I’m making correct choices here. It’s very possible that I’m completely wrong in my decisions. I already got through the Dragonfly forest where I fought the Birdman and a Poacher, so I’m in the third out of four forests – the Spider Forest. There may be more than these four forests, but nothing seems to indicate that this is the case except for the fact that it only took me about four hours to get here. Poachers are reoccurring bosses with monsters of their own. In the Spider Forest, I fought another poacher and found my first barrier transition between screens. It’s possible I’m looking too much into this, but it looks like the Spider Forest is so big, there was a need for a special transition where the game loads more of the content. 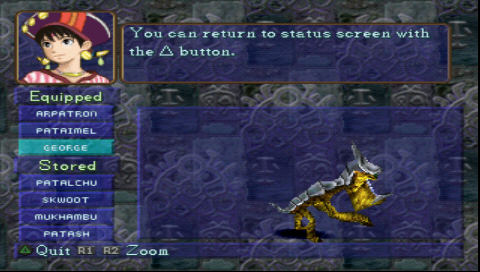 The regular screen transitions seem to be load free, so even the monsters (which are always visible and not completely random) can follow you from screen to screen. 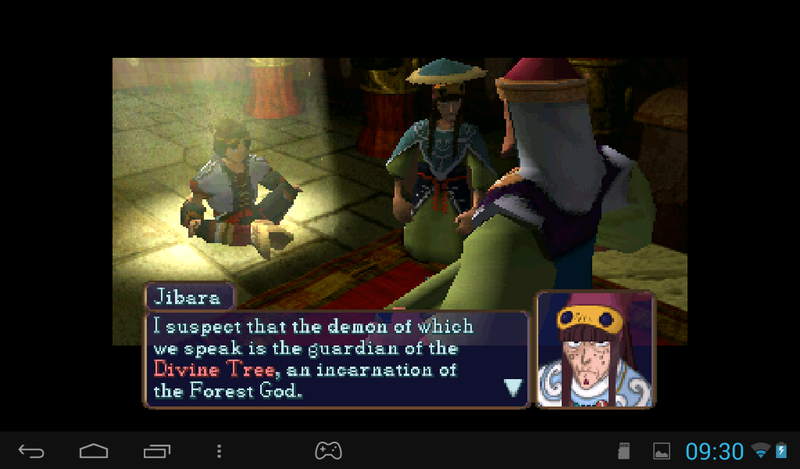 The forest is full of strange creatures with strange mythology I don’t really understand. The story is a classical people rebelling against their gods and traditions plot, with this being viewed as mostly a bad thing. That is, the rebelling against gods part is labeled completely bad, while the traditions part is more murky. There are also lessons about love and mutual respect somewhere in there, but it’s nothing hugely special. It’s simple and enjoyable, but probably not deserving of any prizes. 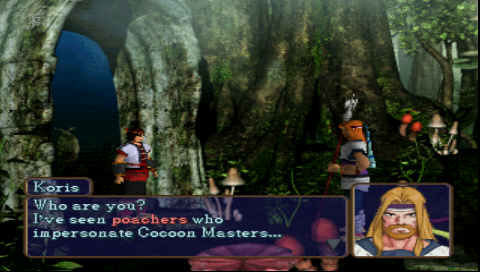 Half-way through the Spider Forest, there was a huge twist where some people in the home village reveal themselves to be complete assholes and idiots, and now I’m stuck following them, it seems. Since you get an item that allows you to go back to the city at any time very early in the game, my usual play style is to follow a single branch of a path until I reach a dead-end and basically explore the forest like I would a maze. I capture any monster I see until I have at least one of each, and then make notes about their stats back in the city, limiting myself to only capture those with appropriate stats from that point on. The map of the forest. Once I reach a point where everyone is hurt too much, I use my Hunter’s Earrings to go back, heal, and merge monsters, making my next attempt that much easier. This is what I’ve been doing for the past four hours and this is what I intend to keep doing until it stops working. For now, I’m very much enjoying the game, the monster collection and the atmosphere. I’m also greatly enjoying my new gadget. It allows me to take notes with background apps, instead of bringing a notebook with me everywhere I go, which should prove useful. There are some great times ahead. Vandal Hearts  – Game Won!